Dr. Ann Kinoshita became our associate doctor in 1993. Graduated from California School of Optometry, Berkeley, in 1991, she completed a primary care residency with an emphasis on ocular disease form the Pennsylvania College of Optometry, Philadelphia. 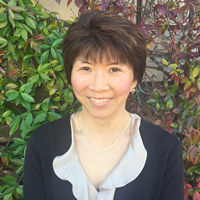 Dr Kinoshita is a member of the American Optometric Association, the California Optometric Association and the Santa Clara County Optometric Society. In 1996 she was voted the Santa Clara Society’s “Young OD of the Year."